President Emmerson Mnangagwa's government looks to be lining up opposition leader Nelson Chamisa's uncle Peter to be the fall guy after the Zanu-PF leader angrily blasted an unnamed official for allegedly withholding fuel meant for farmers involved in the government's much-hyped Command Agriculture programme. 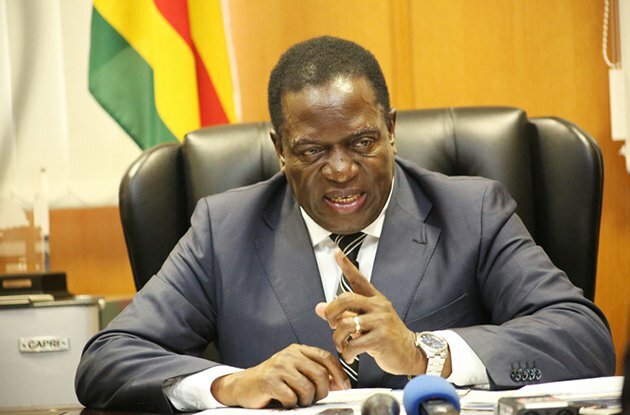 In an unrestrained tirade, Mnangagwa attacked the "leader of the programme" at a Mwenezi Zanu-PF rally last weekend for allegedly undercutting his efforts to shore up the economy through his Command Agriculture scheme, which is now beset by huge problems. Initially, the attacks were widely seen as targeted at Kuda Tagwirei whose company Sakunda Holdings was appointed by the government in 2016 to be the main driver of Command Agriculture. But Information, Publicity and Broadcasting Services ministry permanent secretary Nick Mangwana claimed the 76-year-old leader was in fact referring to Peter Chamisa, a provincial officer for the Agriculture Extension Services (Agritex) who is related to the 41-year-old leader of the largest Zimbabwean opposition party. "Masvingo leadership informed the president that he held on to fuel coupons and refused to distribute them, only distributing them after the fuel price review when the fuel companies were now discounting them," Mangwana said referring to Redan Petroleum (Private) Limited's decision to debase the value of coupons bought before the January 12 increase in the price of fuel. "They also informed the president (prior to the Mwenezi rally) that he was giving Command Livestock animals to civil servants who had no land instead of the target beneficiaries." A career civil servant, government officials claimed Chamisa was attempting to sabotage Command Agriculture as part of the opposition leader's "kudira jecha" agenda. Chamisa has frantically denied the claims, saying he has never been involved in politics, but said he has been working his whole life quietly and diligently behind the scenes at Agritex to get agriculture moving. "His Excellency was referring to ...Chamisa, the provincial Agritex officer-Masvingo," Mangwana told the Daily News in a blistering statement. Chamisa staunchly denied attempting to sabotage the Command Agriculture programme, and said he found the accusations against him incredibly disturbing. "I am just hearing it also. We handle fuel when it comes and we distribute it to farmers, the coupons. "Right now, we are just preparing information at our system, I cannot comment about that. I am sure you know even the Head of State commented on it, so for me it's a bit sub-judice and too sensitive as of now," Chamisa told the Daily News. "Yah, it's done in districts, maybe you should confirm with the districts. "Districts are the ones that identify the beneficiaries, we just process for them. We collect from Harare then give to districts who in turn give to farmers." Asked why he thought he was being singled out for vindictive treatment, Chamisa said: "We are trying to find out (as well) because probably people don't have enough information. So, people are throwing speculation around." He declined to comment if he was related to the opposition leader. Chamisa has served government his whole life. He has worked in Agritex in several provinces, including Mashonaland Central, Midlands and now Masvingo as provincial officer. Zanu-PF provincial chairperson Ezra Chadzamira raged about Peter in an interview with the Daily News, alleging many Masvingo farmers had vented about his disloyalty and also fumed that Chamisa's uncle was sabotaging Command Agriculture. "Command fuel was held at Agritex offices by an officer called Peter Chamisa. He released the fuel when it was rebased from 20-litre coupon to eight litre coupons. That's when he released it to the farmers," Chadzamira told the Daily News. Asked why they thought Chamisa did that, Chadzamira, who is also the Masvingo West Zanu-PF Member of Parliament retorted: "That we don't know. I am telling you that fuel came to him but he was saying it didn't come. He then released fuel when it reduced the quantity from 20 to 8-litre coupons, that's when fuel started going to farmers. So, he sabotaged the Command Agriculture through that." Asked if the Zanu-PF leadership engaged Chamisa on the inordinate delay in the release of fuel, Chadzamira said: "Isn't it his job? Do you want us to move across all departments in the province checking if people are doing their jobs? We saw it when people started asking, following up on their fuel, and they were told its not there, and then all of a sudden, the fuel was availed. "He was also involved in shady deals with Command Livestock. Some civil servants benefited from the Command Livestock, getting cattle when they did not have farms. "We discovered that when we went to Mwenenzi to launch Command Livestock where the farmers and chiefs complained bitterly that you come here to give cattle to civil servants when we the owners of this area have nothing."